At the moment this page is just a placeholder. Some details mainly about the GPIO pins and pads on the bottom will be added. 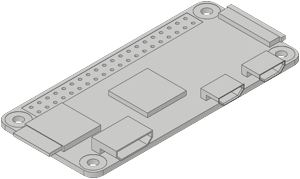 This is a simplified CAD drawing of the Raspberry Pi Zero that I created to help me with my case designs.